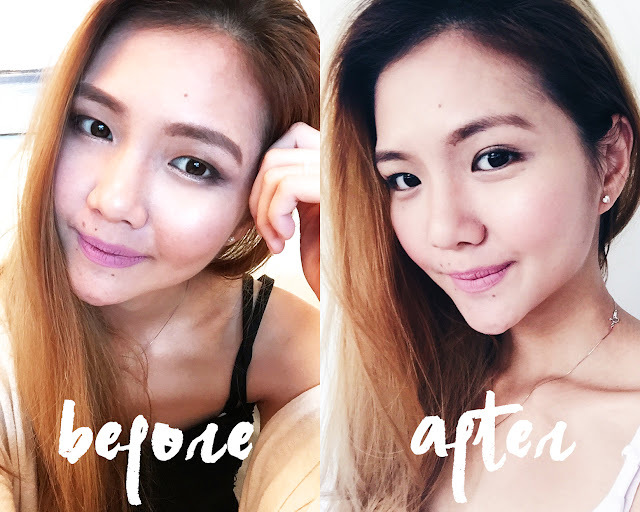 I've been getting lash extensions done by Kimme (formerly from @eyewantlash) for a couple of months now and have loved it since day 1! Lashes aside, Kimme's one of the sweetest person I've ever met and her service is really good as well! Even though I had my first ever eyelash extensions done with her, she made me feel completely assured, erasing any doubts I ever had. Recently, she went into a joint venture with another really friendly lady named Audrey and they're now known as EyeFringed! 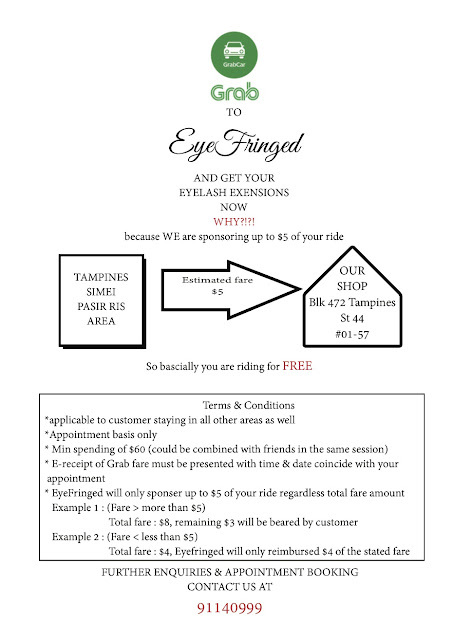 I made a trip down to their cosy shop at Tampines with Kylie a couple of weeks ago to get my lashes done just in time for my birthday and I must say, I love their new place! They even have a waiting area with a television for boyfriends to kill time while their girlfriends get their lashes glamoured up (or in my case, for my kiddo). One session usually takes about 2 hours so it really helps that they've a waiting area to keep people entertained! Audrey was a real sweetheart to help keep Kylie busy too while I got my lashes done! 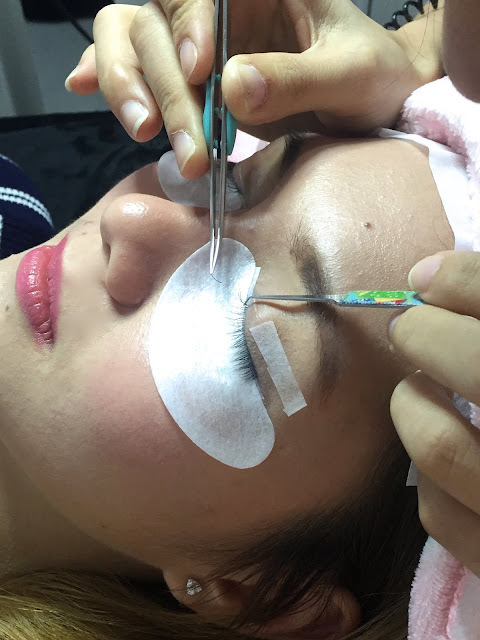 Different beauty parlours provide different kinds of lash extensions and have various ways of doing it. 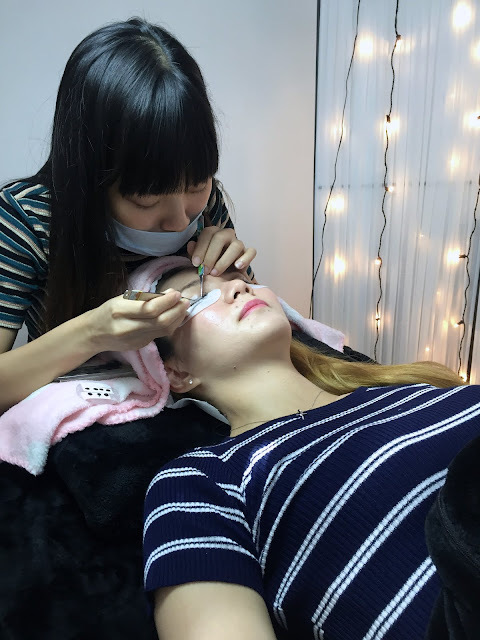 When it comes to my eyes, I find it really important to find a trustable one to do it for me & EyeFringed prides itself on using only quality lashes and glue from Korea! 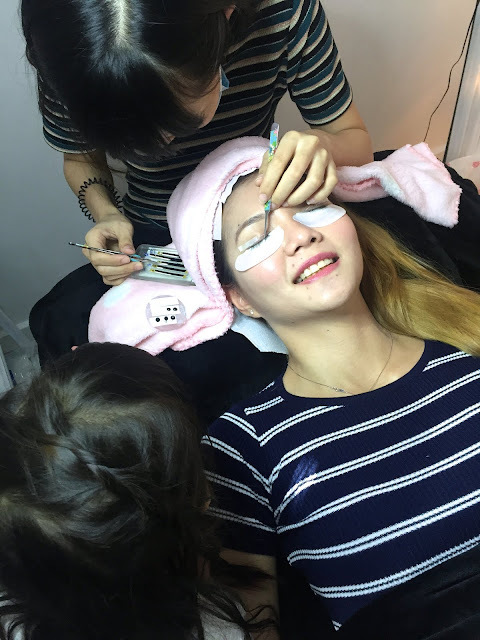 Before starting on my extensions, Kim tapes down my lower lashes and the corner of my eyelids and places an eye mask below my eyes for better application of the lash extensions and also to give my eyes a mini "spa" while she busies herself with sprucing up my lashes! The lash extensions done by EyeFringed are single lash extensions and not cluster lashes. 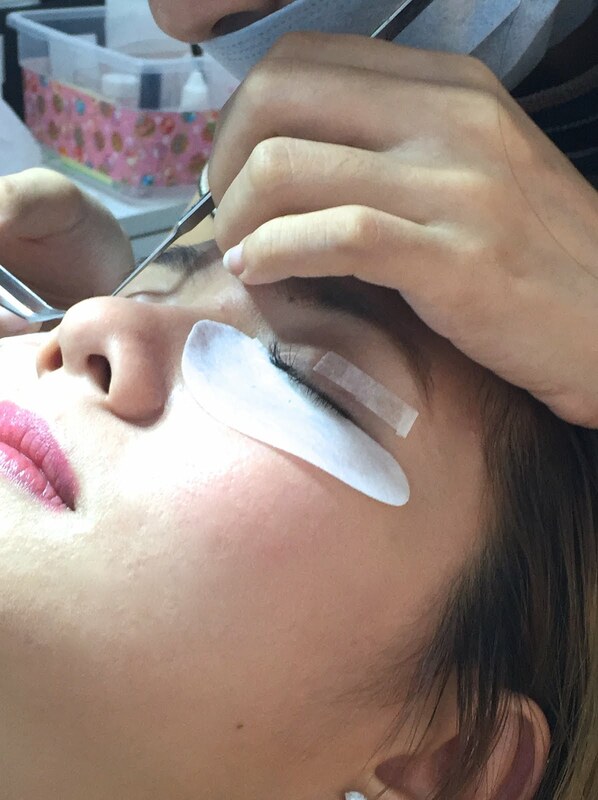 This means that the individual strands of extensions are carefully attached to a single lash at a time unlike cluster lashes which are attached to a few of your natural lashes at once. 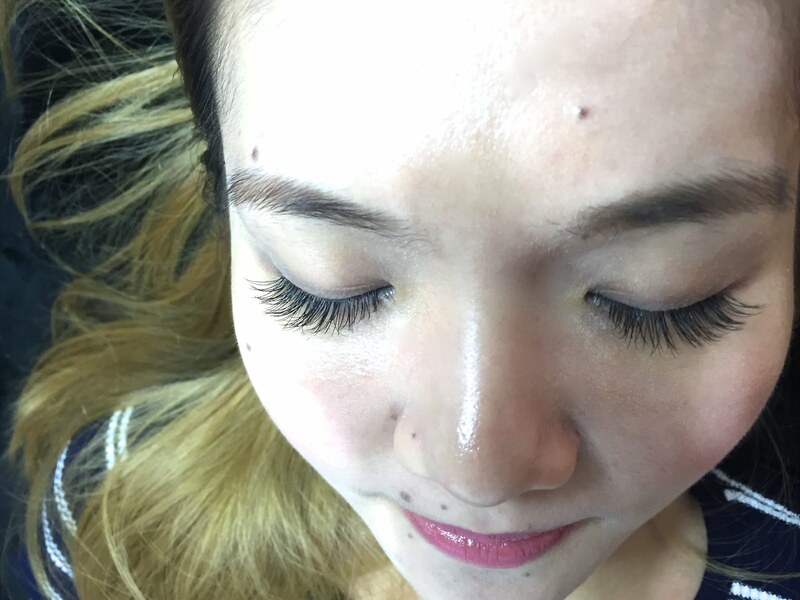 Although the procedure of getting single lash extensions takes a longer time and is a little more pricey compared to cluster lashes, they're generally a lot better because it grows out comfortably without tugging on the other lashes which may cause pain and damage your natural lashes, causing them to fall out. 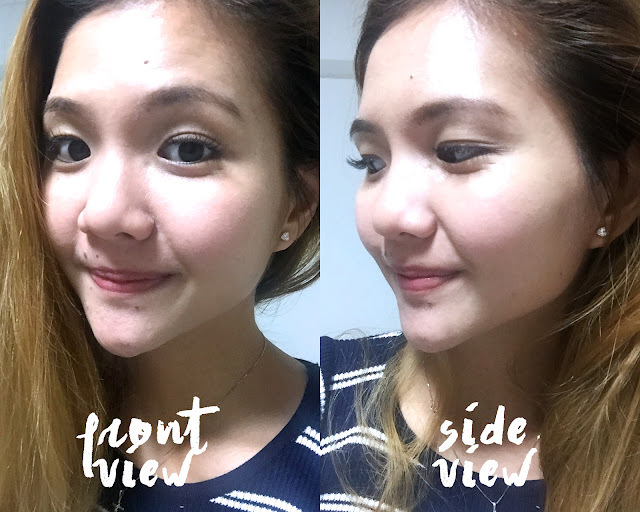 They also look a lot more natural compared to cluster lash extensions! 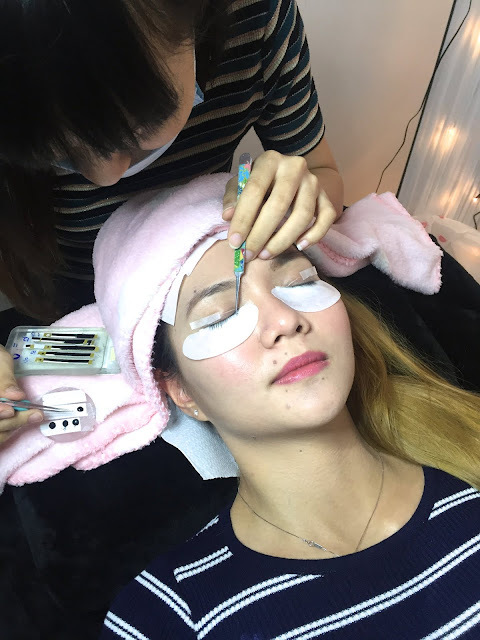 Many people have this common notion that the process of getting lash extensions done is painful but having done it multiple times with Kimme, I can guarantee you that it's not one bit painful at all ( or at least for extensions done at EyeFringed )! As you can see, I'm smiling in the picture and on most occasions, I usually end up falling asleep during the session (apparently they call it the lash nap) so I basically wake up looking gorgeous! & in case you were freaking out, those aren't needles that Kim's using btw! They are just regular tweezers used to hold and attach the minute strands of extensions onto your natural lash! EyeFringed provides lash extensions of different styles and lengths to suit your wants/needs. What Kimme did for me was the Glam look but I've also done Volume extensions and Mixed Volume. 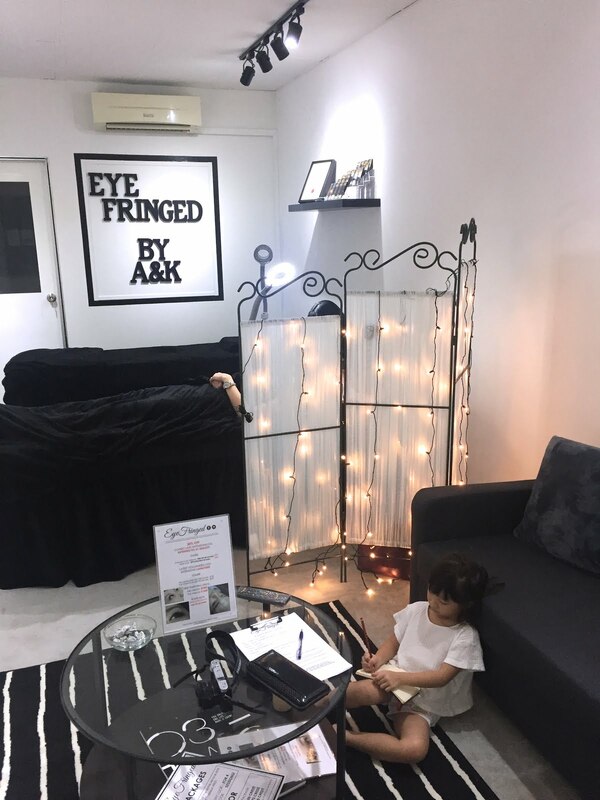 Depending on the shape of your eyes, the ladies at Eyefringed ( Audrey & Kimme ) will advise you on the style that would best suit you! End result! Incredibly gorgeous lashes! 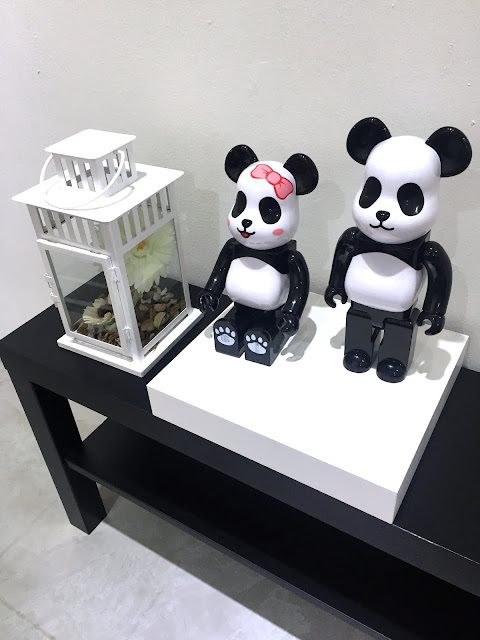 You can totally see the difference! & just so you can see it better, here's me before getting lash extensions done with full eye makeup and an after photo of me with lash extensions and completely zero eye makeup! Lash extensions really enhances your look. Even without makeup, I still look great which is perfect for a busy mom like me cause sometimes I don't have the time to put on makeup but me being vain, I still wanna look good so lash extensions is actually damn awesome for busy/lazy/vain people like me! hahaha! 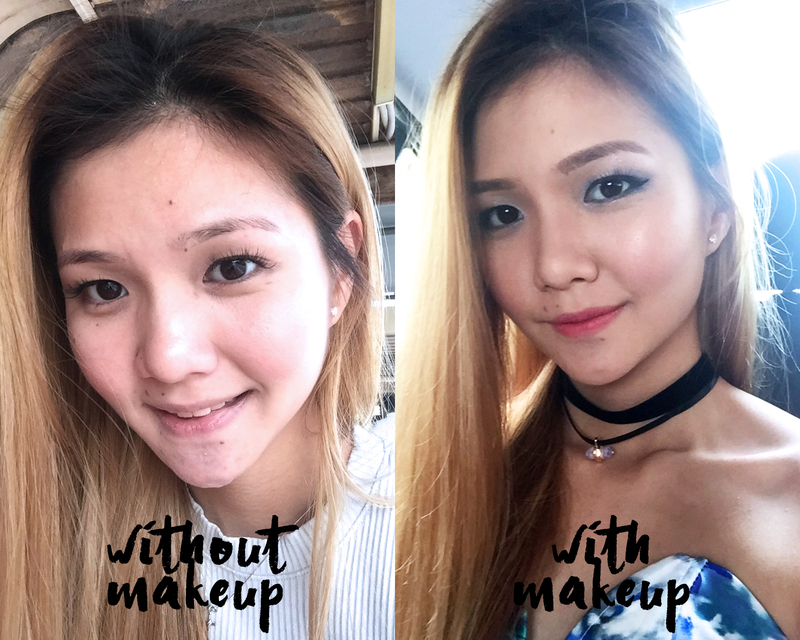 When I do put my full makeup on, I don't even have to apply masacra (and accidentally stab my eye with the mascara wand or go through the hassle of removing that stubborn waterproof masacara)! 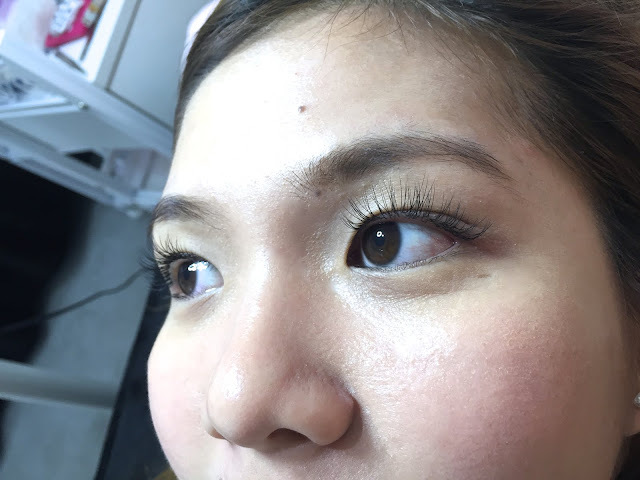 I REALLY love lash extensions and after doing it for the first time, I just couldn't stop going back to get them done and touched up over and over again! It really makes a whole lot of difference and EVERYTIME I wake up from my "lash nap" and see myself in the mirror, I can't help but go WOWWWWW! 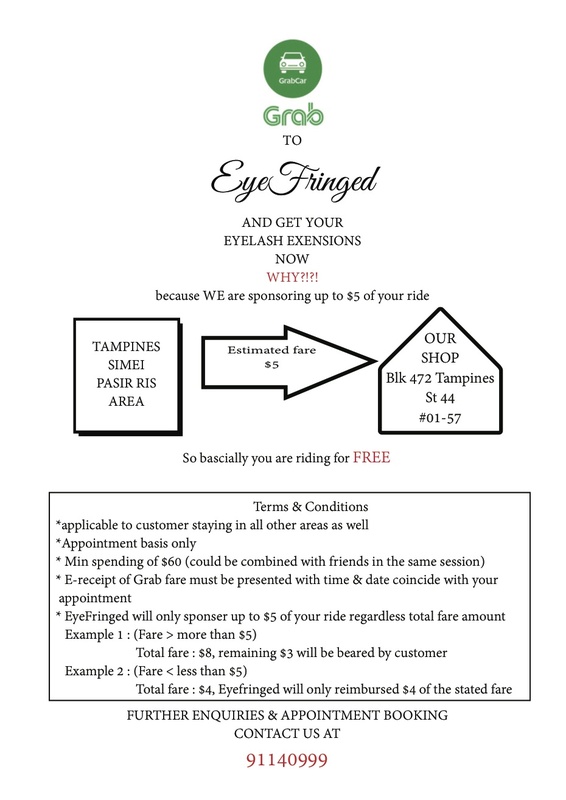 EyeFringed is having a promotion for the month of September!